Crowds gather at the entryway to the Church of the Holy Sepulcher. Six denominations hold rights to the structure. It is an uneasy alliance at best. Of the six, the Greek Orthodox, Roman Catholic, and Armenian Orthodox are major players. Each has “customized” areas within their exclusive control. Paralysis reigns elsewhere. There are no Protestant fingerprints in the building. On this day, I venture into Armenian territory. I step carefully down darkened stairs to the Chapel of Helena. It was Helena (c. AD 250-330), the mother of the first Christian emperor of the Roman Empire, who identified the site and built a church over it. Since her day, the building has been destroyed, rebuilt, and modified. A chapel constructed by the Crusaders and dedicated to the memory of Helena rests deep in the ground on the eastern wing of the complex. Layout of the contemporary structure. The stairway and the Chapel of Helena is marked in red. The cistern, otherwise known as the Chapel of the Invention of the Cross, is marked in green. As I walk down the stairs I am staggered by the thousands (tens of thousands?) of crosses carved into the walls of the passage. Each suggests an anonymous pilgrim, not satisfied to simply carry an experience away from this place, but driven by the impulse to leave some mark behind. I brush my fingers over these strokes and realize that my own journey to the cross is an extension of theirs. Carved crosses along the stair walls. I reach the bottom. Before me is a dimly lit room preserved by squatting columns. The side walls are of cut stone, the floor, of mosaic, and the ceiling, draped in lamps and censors, is focused upon a rotunda. Natural light spills in from the ground through high windows. Opposite me, on the far side of the room are two apses and another stairwell. The stairwell descends to a cistern deep in the earth. As for the side walls, their lower courses once formed the nave of the original 4th c church. The rest is a product of calloused Crusader hands, opened up as the rubble was cleared from the destruction of AD 1009. Out of the ashes, the Franks raised a mighty structure. It was new over old, west over east; Romanesque over Byzantine; but the “crypt” would forever be linked to Helena and her discovery. In the adjacent cistern rested the ultimate relic: a fragment of the true cross. Legend has it that Helena sat on a marble chair supervising her dig team as they searched for the sancta crucis. Mark Twain claims to have seen her seat at the time of his visit in 1867 (See here for his text.). The saintly throne eludes my eyes. The two apses in Helena’s chapel are mentioned by Twain as well. Not surprisingly, the canopied altar in the center apse is dedicated to Helena; the one on the left is more unexpected. Here, one finds space dedicated to Demas or Dismas, the penitent thief crucified beside the Christ (Luke 23:39-43). While the character goes unnamed in the gospels, tradition is quick to remember him. The Altar of Demas (left); the Altar of Helena (right). As I stand in the chapel, a man in plain clothes enters. He walks past me, past the railing, and stands before the altar. He places his hand on an Armenian cross. He pauses for a moment, eyes closed, lips moving. Is he identifying with the forgiven thief? He leaves. I can only imagine his story. Having recently traveled through the heart of ancient Armenia, I recognize these canopied altars are built in the shape of medieval churches. I’ve seen them in the area of Lake Van (see, for example,here). The likenesses ars stunning. Similarly, the mosaics on the floor picture prominent Armenian structures (as well as a representation of Noah’s Ark!). One might be tempted to believe that these mosaics are ancient. Truth is, they were laid in the mid-20th century, as the chapel was “Armenianized” to remember famous individuals, annihilated communities, and destroyed churches. The stone khachkar (memorial stele) on the north wall, wooden decor, and glorious painted murals underline this tradition. This mural on the south wall is fascinating. Note the stone church on the upper right that resembles the canopied altar structures of Helena and Demas. Several Armenian priests in black wear the peaked hat reminiscent of Mt. Ararat. Finally, in the background, the twin peaks of Greater and Lesser Ararat loom on the horizon. Detail from the mural above. I am unable to decipher the Armenian caption here, but this mural may depict the victory of Heraclius over the Sassanids and the subsequent return of the true cross to Jerusalem in AD 629. Note the cross riding behind the priests on the upper left. It continues the threaded story begun with Helena and her discovery of the true cross. To capture some sense of the room as it appeared in 1838-1840, see the painting of the traveling artist David Roberts. Roberts’ vision gives us a simpler view, lacking many of the modern embellishments. 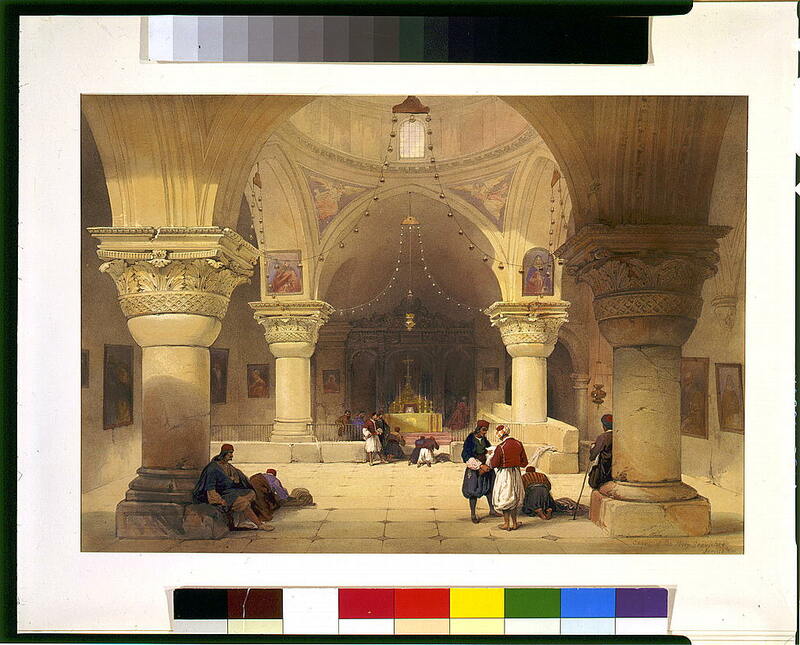 The Chapel of Helena, as painted by David Roberts (See here). Newer PostFire in the Hole!